Hide your plasma or LCD screen behind fine art. Your Plasma TV will no longer be the stark, center of attention, detracting from your room's decor and aesthetic sense. Your beautiful framed art takes command and provides the most pleasing focal point, until you press the button to reveal what's hidden . . .
About TV Coverups . . . Your Plasma TV will no longer be the stark, center of attention, detracting from your room's decor and aesthetic sense. Your beautiful framed art takes command and provides the most pleasing focal point, until you press the button to reveal what's hidden. Manual and fully automatic units available from $399. No Art? No Problem! We have an Extensive Selection. How about a mirror or dry erase board, map or photograph? The possibilities are endless! Click Here to view our systems, or Here to check out the Art. You can use Your Art, or choose from our huge availability of Original Oils or Giclee reproductions. We even offer beautiful custom framing. And - Good News! 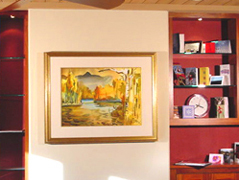 The size of the framed art is not restricted to the size or proportion of your LCD, Plasma or DLP Television. Make it any size you like, and use the extra space to add speakers, or for a dramatic presentation of the plasma screen. We also offer custom made, Theater Installation Boxes, for custom recessed "in wall" installation. Imagine having a Streamlined Living Room, Family Room, Bed Room or even Board Room, with beautiful custom art, deluxe framed mirror or any other accoutrement, and the TV is only revealed . . . when you decide. 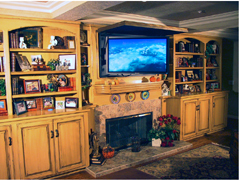 The TV Coverups Fully Automated Theater Installation package allows for "on wall" or custom recessed " in wall" installation, to completely enclose and hide your Plasma TV. Our TVC fully automatic unit, plus the Theater Installation Box, Instructions and full customer support are included. 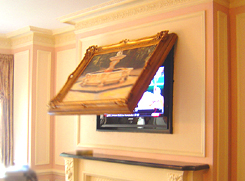 The TV Coverups Manual Theater Installation package allows for "on wall" or custom recessed " in wall" installation, to completely enclose and hide your flat panel TV. All of the manual lift hardware, plus the Theater Installation Box, Instructions and full customer support are included. The TV Coverups Basic Manual Installation package allows for "on wall" installation, to raise and lower your art to hide your LCD or Plasma TV. 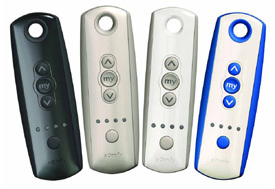 All hardware, plus Installation Instructions and full customer support are included. Hardware shown with picture frame attached. Our Business Hours are by appointment. If there is no authorized dealer in your area you can order directly from Soundscape with a 10-day, satisfaction, money-back guarantee.